Start your review of Nicole Bond. Send a message to Nicole Bond. Thank You! 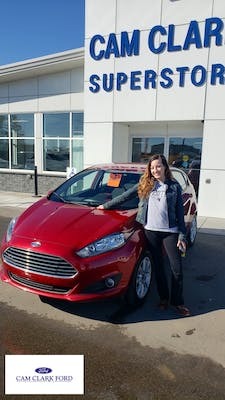 Your message has been sent to Nicole Bond at Cam Clark Ford Airdrie. "I love my F150 "
Friendly and no surprises dealership. Good service. The service and the info I want I got it! Happy for now. Tell the truth and what I expect is what I expect. The Team was excellent in communicating every step and orientation of my new truck. 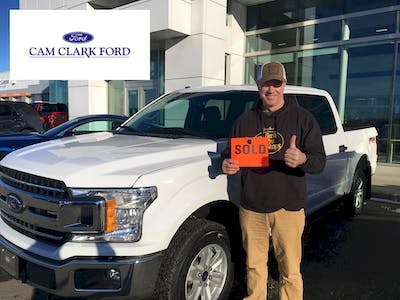 I highly recommend Cam Clark Ford if you are looking for a vehicle or service! Bryan and his team went above an beyond for me.. I never doubted or questioned their abilities to provided what i needed. They made it painless and easy to purchase my vehicle... delivered it straight to me 7 hours away! I will be happy to recommend Cam Clark! Thank you Bryan!! As a first time buyer of a vehicle, I was nervous walking in and unsure that I was making the right decision. I walked in and was greeted and welcomed in by a very pleasant young lady. We sat down and talked about what I was looking for and what would fit my families needs. Being a single Mom on 1 income I really wasn't getting my hope's up to high at that point. After a bit of discussion I was brought over to a gentlemen who made me feel comfortable and answered any questions I had. After test driving a couple to my surprise found me the perfect vehicle for my needs and was over and beyond anything I could have imagined that was with in my budget. Sitting in this vehicle gave me a whole new confidence about myself and I truly couldn't be more happy! I experienced the best customer service right from the second I walked in the door up till I got to put that sold sign on it and drive it away. For those of you out there who are maybe like me thinking that there's no way a vehicle like this is possible for you ... I say never say never, it happened for me and it can happen for you. My experience ... priceless !! 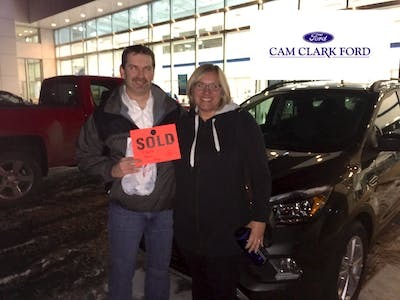 "Awesome new car on my birthday!Thank you cam clark ford! " Awesome customer service from Brad Musat ,he really helped me find an affordable car that suites me and reminds of my old car. Nicole Bond was very awesome at her job as well! and got my in my new wheels as soon as she could,she was so helpful to me. Thank you so much Cam Clark Ford for your awesome staff!Good people like these two make this experience easy and fun!Thankyou again so much! Melanie at Cam Clark Ford was so helpful during the process of buying my vehicle. She followed through with her word and was honest and respectful. I am so thrilled with my new Jeep and happy I was able to have a positive experience that was not rushed or pushed by anyone. I will definitely return to Cam Clark in the future! Great service. Ron and Nicole were both fantastic. The service was prompt and both did well to see that I got the best deal possible. Easy going, relaxing, no pressure. Everyone was super helpful with my questions. Brad , asked what I was looking for in a truck and did a great job finding the perfect truck for me. Nicole made the financing super easy. Khan made me feel very comfortable throughout the whole experience. "Great people, service & value!" Ron and Nicole made this by far the best vehicle buying experience we’ve ever had at any dealership. From the moment we first met Ron we knew we were at the right place and working with the right people. His easy going, down-to-earth demeanour and straight-shooting approach made him a pleasure to deal with and the selection process easy and simple. Nicole made the financial decisions painless and alerted us to some good financing options that we hadn’t considered. 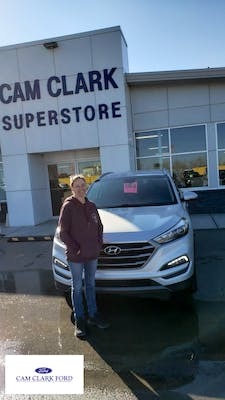 We arrived in search of a used vehicle and finished with a new 2018 Escape but perhaps the thing that stood out the most for us was the complete absence of any pressured sales tactics or forced decisions... instead it was a patient, comfortable process that left us feeling confident that we made a smart purchase from the right place and at a price we knew was as good as we could possibly get. Many thanks to both of you!